A joint venture of The JBG Companies, ROSS Development & Investment and the CIM Group, 7770 Norfolk is expected to deliver in mid-2015. 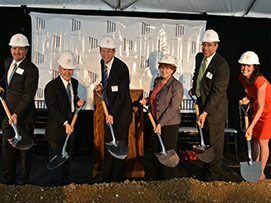 The new 17-story development at the corner of Woodmont and Norfolk avenues includes 244 units—15 percent designated affordable—and 6,000 square feet of retail space at a prime location directly across the street from Bethesda’s Veteran’s Park and three blocks from the Bethesda Metro station. 7770 Norfolk’s exterior design, by FXFOWLE Architects of New York, N.Y., emphasizes urbanism, technology and sustainability. Crisp, white metal panels wrap the building’s façade and are juxtaposed against minimalist glass and textured bronze panels, creating a stunning statement on the Woodmont Triangle streetscape. A public pedestrian pathway connecting Fairmont Avenue with the public parking garage on Woodmont Avenue will enliven the street front with a public art series by Frederick, Md., artist William Cochran. The street-level retail is envisioned as restaurant and café space that will keep the area active. The interior architecture, designed by Cecconi Simone of Toronto, marries modernism with detailed styling. An urban rooftop pool with outdoor living rooms and scenic lookouts from the upper stories add to the modern vibe that 7770 Norfolk is introducing to the Woodmont Triangle area. In addition to the rooftop pool and outdoor living area, amenities include a JBG-branded Kick Fitness Center and extensive concierge services. Designed as a LEED Silver building by the U.S. Green Building Council, 7770 Norfolk also features an open roof system, bicycle storage, electric vehicle charging stations in four levels of underground parking and smoke-free living. For additional information on the development, visit www.Live7770.com. Headquartered in Chevy Chase, Md., The JBG Companies is a private real estate development firm that develops, owns and manages office, residential, hotel and retail properties. The company has more than $10 billion in assets under management and development in the Washington, DC area. Since 1960, JBG has been active in the communities where it invests, striving to make a positive impact. More information can be found by visiting the company’s website: www.JBG.com, or by calling 240.333.3600. ROSS Development & Investment, a Maryland-based company headquartered in Bethesda, was founded in 1983 by Scott Ross, its president. RDI’s unique structure of affiliated multifamily real estate companies, ROSS Management Services and ROSS Renovation & Construction, combines to create the ROSS Companies. These affiliations provide investment partners with extraordinary benefits and synergies: acquisition, new development, due diligence, finance, property management, asset management and renovation. These combined skills have created the foundation for long-standing and continued success. More information can be found by visiting the company’s website: www.TheROSSCompanies.com, or by calling 301.657.8899. CIM Group is a leading real estate and infrastructure investment firm that since 1994 has systematically and successfully invested in dynamic and densely populated communities throughout North America. CIM Group draws on its experienced team of real estate, investment and finance professionals to identify and pursue investment opportunities in three primary strategic categories: repositioning and development projects in established and emerging urban areas; well-positioned operating properties in transitional and established districts; and infrastructure. CIM manages three distinct portfolios, including opportunistic, stabilized and infrastructure funds, each of which are diversified by geography and type of property within that risk profile. These portfolios are supported by a full array of expertise in real estate-related activities. Headquartered in Los Angeles, CIM has offices in New York, the San Francisco Bay Area and the Washington, D.C. Metropolitan Area. For more information, please visit www.cimgroup.com.